Kyoto Katsugyu is famous for offering beef cutlets of the highest quality in its unique style and attracts beef lovers from inside and outside of Kyoto. Katsugyu keeps the natural taste of fresh wagyu and sirloin beef by deep-frying them in a high temperature for a very short time (only in 30 seconds!). 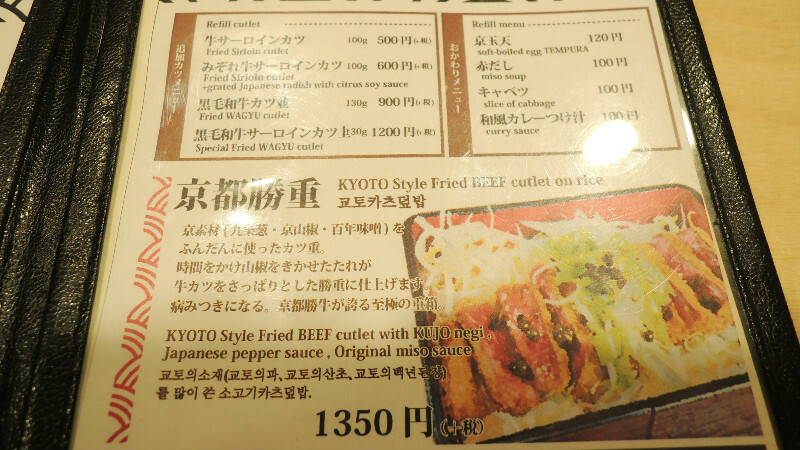 In this way, crispy coating contains juice and tenderness of the beef inside and makes the cutlet even fleshier. The original way of eating beef cutlets with wasabi (green horseradish paste) gives you the flavour you have never experienced. Conveniently located close to the Kyoto Station, the restaurant is often packed with a mixture of people, smiling families, active youngsters, relaxed businessmen as well as happy couples. All of them have common air of excitement – I want to eat really good beef! A bite of this cutlet surprises you by the amazing contrast between the juicy beef and crispy coating. You can enjoy the cutlet in many ways with a variety of seasonings (soy source with wasabi, Japanese pepper and salt as well as Worcester and curry sources). It is also best-matched with the original miso soup of the side dish, which refreshes your mouth. This cutlet on rice is quite unique in having beef as its main portion while cutlets in other restaurants usually have pork meat. However, what makes the dish a special one is its locally-grown ingredients used, Kujo negi (green onion) and sweet Japanese pepper. A trio of crispy cutlets, rice with sweet Japanese pepper sauce and crunchy Kujo negi gives you a refreshing appetite and makes you addictive to it. A melting egg is hidden in a crispy tempura ball. You are advised to break the ball first, dip your cutlet in the egg, add curry sauce, and finally put the cutlet on the rice to make your original rice bowl. The egg makes the curry milder and sweeter, matching nicely with rice with boiled barley. What an entertainment ! You can choose your desired doneness of your beef from medium-rare and well-done. The price differs depending on the amount of rice ordered. Ask the waiter if you want to have some more rice with boiled barley. "Gohan no Okawari Kudasai". To be absolutely honest with you, I am not really keen on rare meet and the restaurant kindly made my beef well-done. When I took a bite, I was taken aback by the light taste of the beef and really enjoyed eating all of them. This tempted me to have Katsugyu's rare beef, and I indeed tried a bite. It was super delicious!! You see how fresh the meat is. Chew your beef cutlets very well. The good taste of beef will spread through your whole mouth as you keep doing so. You are recommended to have the cutlets with wasabi and Japanese pepper as the freshness and nice hot flavour makes the taste of beef even better. People share the big table in the back of the restaurant and you may be invited to chat with a person next to you ! 5 minute walk from the central entrance of the Kyoto stn. 50 m from the Karasuma Shichi-jo intersection. The landmark is a big sign board "Katsugyu" in Chinese characters. The menus are with short English explanations. A free wifi is available in the restaurant.